Mount Orjen at 1,894 meters is the highest mountain on the Adriatic coastline and dominates the entrance to Kotor Fjord. Meeting some of the Mount Orjen locals on the way up! We've done this particular hike many times both in the spring or autumn sun, and when there's several metres of snow covering the ground. 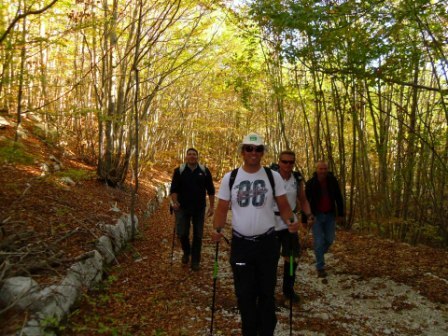 It's a moderate hike that most people will manage without trouble and the scenery is varied and beautiful all the way. 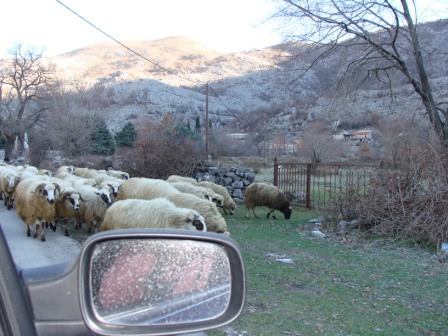 As you head up from Herceg Novi, you drive through local villages where local families tend small gardens and graze livestock, (cows, sheep and goats). The switchback paths which are old Austro Hungarian roads leading up to Orjen. Grab: 1383m (mountain hut – Kamenska plateau – Miskovica Rocks – Grab). 1 hour 45 mins round trip. From Grab you have a view to the open sea and coastline as well as the Vratlo pass. Veliko Cedilo: 1466m (mountain hut – Carevarupa – Zlijebska Jama Ridge –peak) 2.5 hours round trip. Veliko Cedilo is located in the south-eastern part of the Orjen massif. The summit is visible from the mountain hut. Cedilo is one of the best viewpoints, from here you can see the overall size of the Orjen massif. Subra: 1679m (mountain hut – plateau – Subra) 4 hours round trip, 575 m ascent / descent. 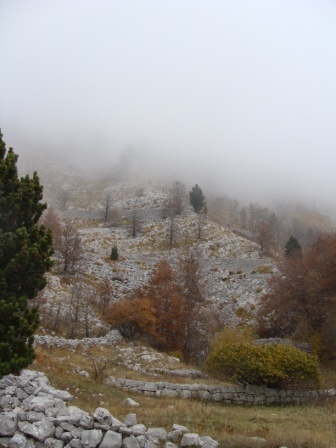 Subra is one of the most significant features on Mount Orjen and the limestone landscape is very impressive. The views from Subra peak are extensive and this hike is well worth the effort. The route crosses limestone pavement, through forest and past sinkholes. Care is a needed on a couple of sections with exposed drops. For those wishing to relax and enjoy the area you are welcome to rest at the mountain hut if you do not wish to ascend further. There is a lake here and the area is ideal for enjoying a well-earned rest and the view of the sea and Mount Orjen peaks. 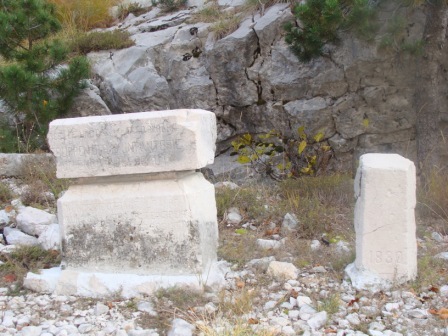 You'll see plenty of Austro Hungarian remnants littered along the paths. Medium. Minimum 7 kms / optional up to 15kms. Initial ascent from trail start to mountain hut 450m. The tour is scheduled every Friday from 7th June to 27th September. Departure is from the Mercator Mexx supermarket in Meljine, Herceg Novi car park at 9am.. The tour lasts for approximately 8 hours in total. 35 Euros per person on all departures for groups of 4 or more. This includes an English-speaking guide and transfers from either Mercator Mexx or Herceg Novi bus station. 2 people: 55 Euros per person. 3 people: 40 Euros per person. Just complete the form below with your details to book your own Mt Orjen adventure.